Today, Wednesday 22 November, marks six months since the terrorist attack at Manchester Arena, which claimed the lives of twenty-two people. Chetham’s students have arranged and recorded a new version of Oasis’ Don’t Look Back in Anger to encourage people to remember and support victims of terror this Christmas. Directly across the road from the Arena, boarding students were woken from sleep to wait through the night as the incident unfolded. Inside the police cordon, they were unable to leave school for 24 hours – and, as the city gathered in Albert Square to pay its respects to the victims, they held their own vigil on the school yard. Appropriately, they used their most powerful language – music – to express their feelings, singing John Lennon’s Imagine and the Oasis song, Don’t Look Back in Anger, in an expression of support and solidarity. One student shared a video of Don’t Look Back in Anger on Facebook, giving students’ friends and family the chance to see their children safe and well until they could get home. Her video was picked up by numerous media channels, and when two days later the song was sung again in St Ann’s Square, it was clear that it would come to play an important part in the city’s response to the tragedy. During the summer, Chetham’s students came together again to plan a longer lasting memorial. Many of those who lost their lives were young people, close in age to Chetham’s students. They were music lovers, listening to pop star Ariana Grande’s concert. These factors, combined with the proximity of the attack, brought it close to the heart of this school – the country’s largest specialist music school, where students earn their places through musical potential, and where music is a shared language for young people from a rich diversity of backgrounds and nationalities. With those things in mind, the Head Boy and Girl, Matthew Wilson and Flossie Plain, suggested a new arrangement of Don’t Look Back in Anger – one which could be recorded and shared more professionally and used to raise funds after the attack. Matthew and Flossie, along with their fellow Sixth Form students, led on the project. They contacted former student Joshua Hickin, who created the new arrangement for trombone ensemble, a small band and the massed voices of the school’s staff and students. Matthew acted as Musical Director for the recording, with Flossie as Producer. The recording took place in The Stoller Hall, the school’s concert venue, supported by the venue’s Technical Manager Simeon Ogden; whilst Chris Mann of Mannmade Productions, a longstanding friend of the school, generously offered his time to produce the video. Head Alun Jones released the entire school from lessons for an afternoon to allow the recording to take place, and finally, permission was received from the Sony Corporation on behalf of Oasis for the song to be shared. Chetham’s are sharing the video online to mark the six-month anniversary of the attack – which also happens to fall on the feast day of St Cecilia, the patron saint of music. They hope that people hearing it will contribute to the British Red Cross UK Solidarity Fund, supporting victims of terror not only in Manchester but across the country. Beautiful video, gave me goosebumps. Such a talented group of young people. 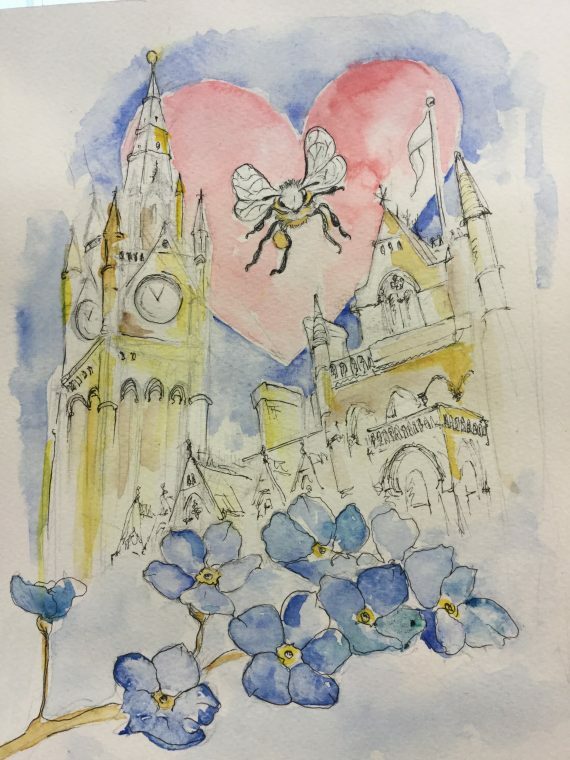 Has the painting above been done by one of the pupils, and if so, are we able to buy a print – it’s fabulous.